I've always had a real thing about speaking in public. Almost a phobia. Cold sweats; hot flushes - and that's before numerous trips to the loo. This is not to be confused with presenting creative work to a panel of stony faced marketing bods or trying to persuade a city council to go with my branding for a major part of their beloved city. Nope - they're two different things entirely. Like loo roll and sandpaper; like taking things at a canter or having the trots: totally different experiences. When presenting creative work I'm responsible for, I know it inside out. I'll have assessed my audience. I'll have an inclination they'll be half-receptive to my ideas. And I get to move the slides on at my pace. So I'm calm, relaxed and relishing the challenge. 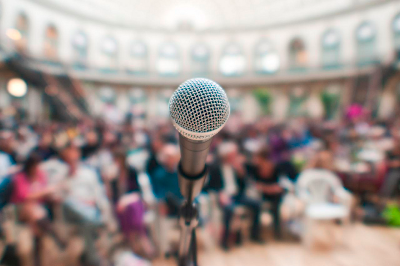 Public speaking for me has always been something far more daunting than an enjoyable challenge. It's been an inhospitable mountain to climb with hell fire at the bottom, vomit-inducing dizzy heights at the top and evil little trolls waiting to laugh at your every move all the way up. Bettakultcha, with its automatic 15 second slide format, takes things out of your control to an extent. It's a bit like releasing the brake on a rickety old train carriage on 1 to 1 incline down a Klondyke gold mine. But for me, Bettakultcha is a wonderful event for so many reasons. Started by two blokes in Leeds, Richard Michie and Ivor Tymchak, the first events took place in front of 50 or 60 people at the awesome Temple Works building in Leeds, lovingly curated by Phil Kirby. 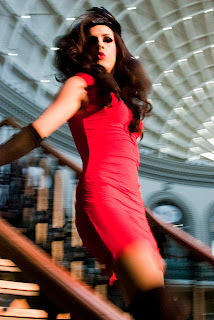 Bettakultcha has since been staged at various other venues, the last couple at the should-be world-famous Corn Exchange. Some have said that Bettakultcha is losing its rough, bohemian edge - I don't think so. You can still bring your own bottle, presentations can be about anything from online comic strips to the wonderful work that people do to help people with cystic fibrosis, to why Star Wars is based on the Mills & Boon format - and the fact that the Bettakultcha phenomenon can now involve far more people without losing its edge is worth it. The format is simple: 13 speakers, 20 slides of 15 seconds each in front of a wonderfully eclectic crowd. Oh and 4 very brave random sliders to top off what is a brilliant evening. It's been described as a middle class variety show. 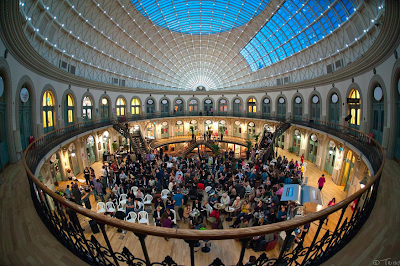 I'd describe it as one of the best events not only that Leeds has to offer, but also that contributes to making Leeds a livelier, more creative, fulfilling place to be. 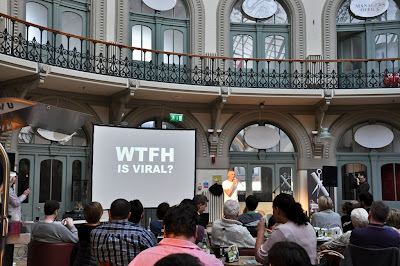 Bettakultcha VIII was held at The Corn Exchange on Tuesday the 12th April and I'd booked myself a slot to speak. It's part of my self-induced therapy. I guess I could seek professional help, but my view is that if I am going to tackle that mountain, I'm jumping in feet first, on my own. The audience at Bettakultcha is a huge help - I liken it to taking on The London Marathon for the first time: the crowd wants you to do well and adds an extra 10-20% to your performance. I did a 5 minute spell on viral marketing, a little tongue in cheek - but you can't really go too deep in in 300 seconds. I came off a little disappointed that I didn't get all my points across - some slides went faster than my addled mind would allow and the whole 300 seconds really did feel like 30. But I'm glad I did it. I feel privileged to have been allowed to speak in such an amazing building. I'm extremely grateful to Richard and Ivor. And I'm very grateful to a forgiving audience. And I feel better for having done it. Now that's my kind of therapy. Other great talks were on subjects including making lists, the link between comedy and magic, the history of drag, why Manchester is better than Leeds (controversial) and the madness of Kim Jong Il - not to pick anyone out in particular - every single presentation was hugely entertaining and you can find a list of the speakers here, along with previous events and speakers. It's a great night. It's highly recommended by everyone here at Ouch (that'd be me) and it's something you should try at least once while you're in Leeds. And talking of therapy, if you fancy a go at presenting at Bettakultcha (and so many of the audience seem to be inspired to do so) there's even some of that presentation therapy I've thus far avoided on offer, for free - the next one being on Friday 16th April. Now I've climbed that mountain, I do actually fancy going to the class to find out how it's done properly!